This followed me home the other day, so I decided to keep it! My VTR is a '98 & my Hurricane is a '88. I always liked the looks of these. Ridden it a couple of times so far. It's not quick, but it is fast when you get it revving. And while it's big & heavy, it doesn't feel like it in the turns. Definitely stable & planted while going down the freeway, nice and comfortable too. It's 100% stock, stock, stock for now. Good thing that it seems like there are no more aftermarket goodies available now . Anyone else have/had one of these? I have owned 3 of these, first one a bought new in 88. After owning several other bikes over the years I decided that I liked the Hurricane the best so bought 2 used ones about 10 years ago. Great motorcycles. Sold them a few months ago , went through withdrawal from not having a bike in the garage. Went out and bought a 04 Super hawk. So here I am. Dayum is she as clean as she looks in the pics? Very nice! Here's a nice one for sale near me. Last edited by captainchaos; 08-25-2014 at 03:05 PM. Never had a 1k but I did have a 600 and it was pretty fun. especially for a beginner. That bike is VERY very clean, nice find! Centar, 04s are the best looking and the fastest, stock. I've had the pleasure of owning a 88 CBR1000F. Great bike in it's day thought the rear rim was too narrow (corrected in 1990). I had a CA model that had slightly retarded cams, I changed the to 49 state cams and certainly changed the power curve but what I noticed is the CA cams made more low end torque and pulled much harder out of corners than the 49 state cams. The 49 staters breathed much better in mid and upper rpms. It was the first bike to say it would break 160, it would, it did and I paid the ticket! I actually still own the bike, unfortunately my ex has it stashed away trying to extract cash, it'll be a cold day as it were! I had the pleasure of attending Honda's 1987 Technician update. Spent most of the time looking at the torn down and cutaways of the Hurricane. Pretty cool in it's day. They also introduced a reverse "gear" that worked off the starter motor on the Goldwing. That being said, I still preferred my '84 VF500F. That is until i saw the Hawk at the show. Yeah it is very clean and only has 7,500 miles, so I couldn't resist the $3k out the door price. Captain, just about, there are a few very minor cosmetic scratches or cracks in the bodywork, but I got it to ride more than show. Oh, & I want the pipes on the bike in that ad! This thing is too quiet. You are partially right about that, it seems that there were seats & pipes, etc. back in the day, but most of the manufacturers don't seem to list anything currently. I'll figure something out. Sorry, I just noticed, your first post! Welcome! I think the Superhawk will fill your mc void fine. Just remember to hold onto the bars tightly when you grab a handful of gas, the instant torque needs to be respected. Used to race a Honda cr480 and Kawasaki kx500,had to have a lot of respect for those to. Especially the kx. Also drag raced a z1r with lightened crank ,no flywheel and remote starter. Yeah I know I'm just giving you a hard time. I certainly understand the feeling-it's hard not to immediately start looking for cool aftermarket parts for anything no matter what it is, and it's kind of a relief when you can't find any haha. Problem like you said, is that nothing is made new anymore, and when you do come across anything used like seats or exhausts, etc it's been around the block enough that it's usually trashed. One of my all time favorite motorcycles. 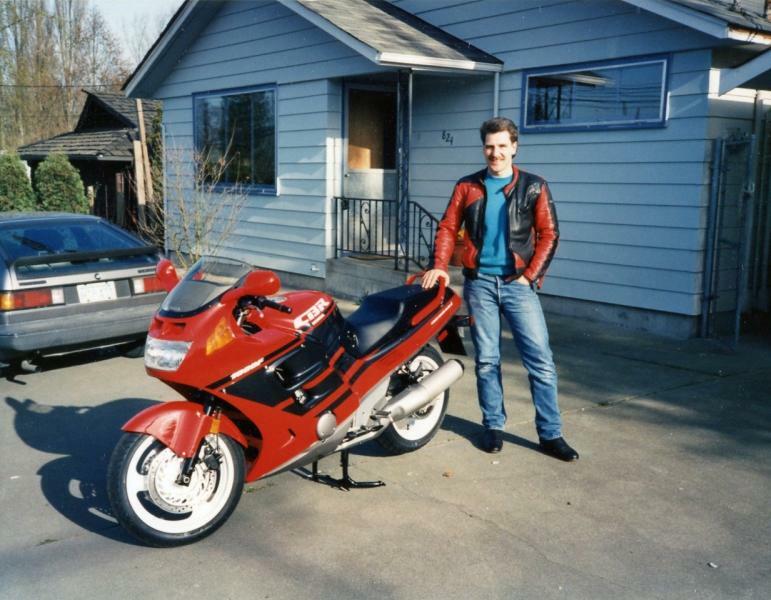 When the "Hurricane" became the "CBR1000F" (I believe in 90'), I waited and bought a brand new 91'. Owned it for 10 years, and loved it, regret selling it. Had a blast "sport touring" on it, and was well suited for the occasional 2-up. Was Honda Bullet proof. Way Heavy, but went damn well for a motorcycle of that time. Here's a pic, (please disregard the dude in the leather jacket). Last edited by Upland111; 08-25-2014 at 07:48 PM. Cool pic of you & your bike. Is that a Scirocco behind you? Sure enough...It was my roommates at the time.